TL; DR: Thankfully, there is no shortage of nonprofit and charitable organizations around the world working toward a myriad of causes to advance the public good. These organizations can be disparate in size and mission. However, there is one thing they all share — the need to attract and retain the donor bases that fund their core causes. Blackbaud connects and empowers organizations to increase their impact through software, services, expertise, and data intelligence. The company operates with the goal of understanding the inner workings and missions of their customers. That’s why Blackbaud provides a consultative approach that matches organizations with solutions based on individual need. Their strong company culture of corporate social responsibility (CSR), coupled with a dedication to innovate how philanthropic endeavors are managed, makes Blackbaud a leader in the effort to advance the social economy. In 2010, Haiti was rocked by a catastrophic earthquake. Seismologists determined the event was one of the strongest in contemporary times, coming in at a terrifying magnitude 7.0. The country was plagued for weeks with aftershocks, at least 52 of which were powerful quakes in their own right, reaching in intensities of up to magnitude 5.0. Widespread devastation was felt throughout the country, and citizens needed help to rebuild vital infrastructure essential to basic survival. Perhaps the most pressing need was to develop a solution to provide clean water to areas most heavily impacted. There were many nonprofits on the ground ready to assist. But infrastructure building isn’t cheap, and these groups needed to raise funds to attain the necessary resources to help. Charleston-based Water Mission was one of those organizations. They were present at ground zero immediately after the earthquake to provide water to the Haitian people. They knew, however, a long-term solution was needed, as many of the areas they were serving were overcrowded and lacked sufficient sanitation to prevent the spread of waterborne illnesses such as Cholera. Water Mission needed donors. Social good cloud software provider Blackbaud helped the nonprofit find them and has since become Water Mission’s long-time partner in advancing the kind of work they did in Haiti around the world. With the adoption of Blackbaud’s solutions, the Christian engineering nonprofit was able to exponentially ramp up their fundraising efforts and attract thousands of new donors. Catherine LaCour, Blackbaud’s SVP of Corporate Marketing, helps nonprofits find fundraising solutions to fit their needs. Catherine has seen many of Blackbaud’s customers realize their missions and causes directed at the greater good. Blackbaud’s ability to help organizations do this is built into their software solutions that power fundraising, digital marketing, finance and accounting, analytics, and the overall management and advancement of cause-driven organizations. However, it is the company’s consultative approach that makes their solutions so effective. It is mission critical for Blackbaud to understand the aims of the nonprofits they serve, Catherine told us. That’s why there is always a representative from their customer base present at the company’s quarterly all-hands meetings. Blackbaud traces their beginnings to a classified ad from a New York newspaper in 1981. The Manhattan-based Nightingale-Bamford School, an all-female, K-12 institution, was looking for someone to write a student billing and accounts receivable program. Blackbaud Founder, Anthony “Tony” Bakker, answered that ad and devised a successful solution for the school. 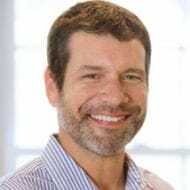 The billing program provided Tony an opportunity to demonstrate the value of his solutions to Nightingale-Bamford, and from there he expanded to the school’s fundraising office. Blackbaud’s history in the charity space earned them this year’s Developers’ Choice™ award for software for nonprofits. Since their original relationship with Nightingale-Bamford, Blackbaud has expanded to serve thousands of organizations of all sizes around the world — spanning nonprofits, foundations, corporations, educational institutions, and individual change agents — to provide solutions specific to the social good space. Most people have heard of the viral Ice Bucket Challenge campaign geared toward raising awareness and funds for amyotrophic lateral sclerosis (ALS) research. What many people don’t know, however, is the ALS Association (ALSA) leveraged Blackbaud software to power the record-shattering campaign. Their campaign was a success, with funds raised directly resulting in a breakthrough gene discovery that might someday lead to a cure. Blackbaud helps organizations, like ALSA, carry out their missions through effective cloud solutions, data intelligence, and extensive experience in the social good space. What sets Blackbaud apart as a service provider for nonprofits is their consultative approach that tailors solutions to organizations based on need. The company keeps their finger on the pulse of what’s happening in the industry by including customers in quarterly meetings. However, Blackbaud understands solutions are not all one size fits all. Their goal is to make prescriptive recommendations for organizations on the best ways to engage existing and potential donors, advocates, and supporters. Blackbaud’s consultative approach allows them to match nonprofits with ideal solutions fitted to specific needs. Catherine could not reinforce enough how important it is for Blackbaud to understand the makeup and mission of an organization to ensure they are providing the best solution. Once the correct tools are in place, Blackbaud can help determine the ideal methods to reach out and attract donors. Through analytics and data targeting, Blackbaud’s solutions create efficiencies where they may not have existed. As Catherine noted, Blackbaud has solutions for organizations of every size. Small or emerging nonprofits can benefit from their eTapestry® fundraising solution to help grow their organizations and increase the size of donor bases. Users can employ eTapestry to analyze data within social media platforms with the SocialMediaFinder™ feature. This works to help identify the networks on which potential donors are most active and allows nonprofits to communicate with them and have them notice brands. Reporting and scorecard tools are also available in a centralized, intuitive dashboard, so organizations can easily gauge which strategies are working best. This comprehensive tool includes an address finder, event management capabilities, and email marketing features. Since it is a cloud solution, eTapestry can be accessed at any location and on any device. Blackbaud’s Raiser’s Edge NXT is an effective fundraising solution for established and medium-sized nonprofits but is also scalable for use by enterprise-level organizations. The cloud solution comes complete with features, such as donor management, reporting, work centers, and a marketing suite, that all work to help nonprofits retain existing supporters and attract new ones. Blackbaud’s Raiser’s Edge NXT software offers a centralized management platform to house constituent data. Blackbaud’s Luminate CRM™ is another solution enterprise-level organizations can use to engage constituents. Luminate CRM is built on the Salesforce.com cloud computing application platform via the Salesforce AppExchange. More than just a relationship management platform, it also provides analytics and data reports so organizations operating on grants can show measurable results to the foundations on which they rely. While Blackbaud’s consultative approach ensures their customers receive the tools right for them, some of the company’s features can be utilized by any type of organization, no matter their size. Though mainly used by general admission organizations, such as museums, Blackbaud’s cultural management solution, Altru®, can be employed by any nonprofit to track revenue in relation to event attendance. The tool also streamlines merchandise sales and provides metrics and insights into what events donors are attending and what they’re buying. Blackbaud Merchant Services can be integrated with their other solutions. The payment platform is easy to implement, meets the industry’s toughest data security standards as a Level 1 PCI-compliant service provider, and provides customers access to real-time transaction data and reports 24 hours a day. Most recently the company added Apple Pay® to Blackbaud Merchant Services so customers can offer donors an easy, secure and private option for digital checkout—all within the secure, simple and affordable donation processing system they have come to rely on from Blackbaud. Blackbaud gives nonprofits the solutions they need to effectively carry out their core missions, and the company’s teams and dedication to innovation in the tech space are large contributors to their success. However, what really gives them the edge when it comes to helping their customers is Blackbaud’s strong culture of corporate social responsibility. The company encourages their employees to engage in social good by volunteering and giving back to their communities. 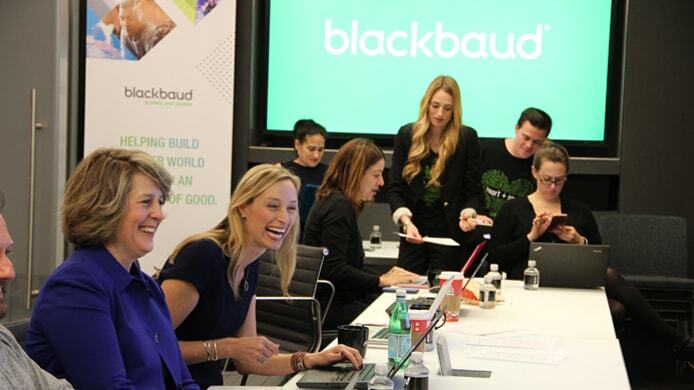 In fact, more than 25% of Blackbaud’s employees serve on charity-related boards. If employees are interested in sitting on a board, Blackbaud facilitates this by supplying a mentor to find a cause that fits their passions and providing regular professional development opportunities targeted to board service. Blackbaud’s strong CSR initiative encourages employees to volunteer and give back to their communities. When it comes to charitable giving, Blackbaud walks the walk. The Charleston-based company recently made a $1 million donation to the International African American Museum currently being built in their city. Catherine said this type of charity work is built into the company’s DNA, and it’s what really helps them understand how to help the organizations they partner with. Blackbaud’s work with Water Mission is just one example of how the company has helped their nonprofit customers positively impact lives and futures. Helping provide 100,000 people lifetime access to clean water is a large undertaking with seemingly insurmountable cost barriers. Blackbaud’s fundraising solution was able to break down these impediments to help expand a donor base. The company shows no signs of slowing these efforts. Catherine told us one of the topics they talk about most at Blackbaud is the idea of advancing the social economy. One way Blackbaud is already doing this is with the Blackbaud Institute for Philanthropic Impact. Launched last year, the Blackbaud Institute works with partners to convene experts, conduct research, and uncover strategic insight from the most comprehensive data set in the social good community. Blackbaud’s annual conference, bbcon, is also an ongoing focus for the company each year. Catherine told us the educational sessions and content are always cutting-edge, but bringing people together to foster community in the social good space is the ultimate goal.